A first-of-its-kind air scrubber and climate control system has been installed at H Timmis, a poultry farm in Shropshire, with the aim of reducing ammonia and improving bird welfare and productivity. VentMax is a 4-in-1 air scrubber, heating, cooling and ventilation system, manufactured by IPT Technology. It was installed in two 50,000 bird broiler sheds in October 2017 and is currently operating through its fourth bird crop cycle. The units are installed externally to the building and filter all air that leaves the sheds, removing dust particles. The technology can reduce ammonia and odour emissions by up to 90%, a feature that proved instrumental in helping H Timmis gain planning consent for expansion from the Environment Agency. But the air scrubbing system is only part of VentMax’s functionality. As well as cleaning the outgoing air, the units also filter the incoming air and provide controlled ventilation and temperatures throughout the sheds. Already they are starting to prove their ability to deliver superior climate control functionality, leading to improved air quality and better internal conditions. “VentMax units combine advanced ventilation technology with intelligent controls to manage air pressure, air movement and temperature,” says John Gill from IPT Technology. “They are also quieter than conventional systems. Bring together all these features and the result is a calm and controlled environment for optimum bird comfort and productivity”. The VentMax units are smart and use programmed algorithms to calculate the required shed temperature and sensitive measurement technology to quickly adapt to changes in outdoor conditions. 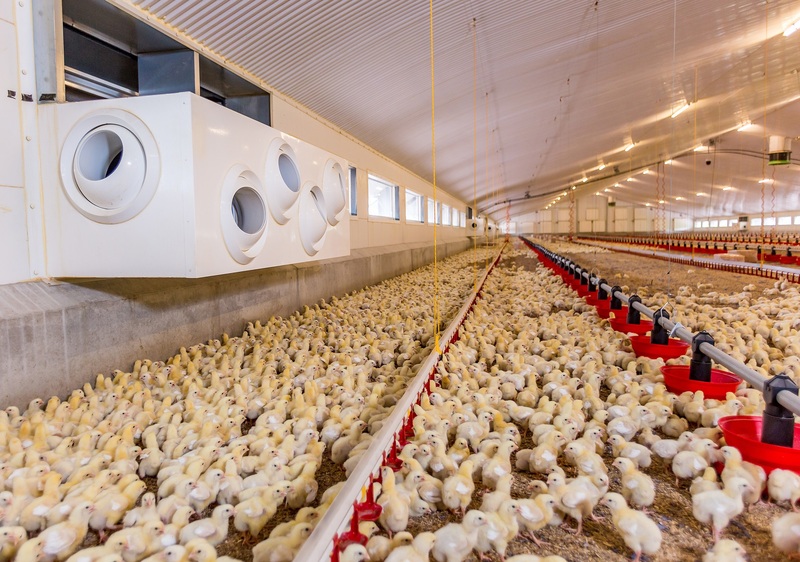 “The heat demand in our broiler sheds always starts high and gradually falls depending on the stage of the bird growth cycle,” says farm owner Rob Timmis. “This winter, despite challenging weather conditions, VentMax has ensured a constant, regulated indoor environment with temperature drifts no higher than +/- 0.5 degrees”. At H Timmis Farm the sheds also have the added benefit of underfloor cooling which is particularly effective at taking heat away, because the heat-generating birds are close to the ground. Removing only a few degrees of heat helps reduce the microbial activity within the litter, and, consequently reduces ammonia and odour. IPT Technology designs, manufactures and installs innovative heating and cooling plant. The product range continues to expand, with the GeoCube, VentMax and OptiRad systems all designed for the agricultural industry.